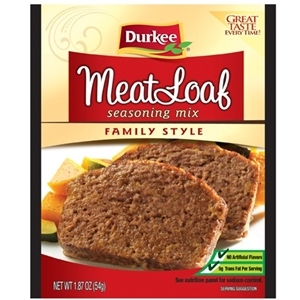 Durkee Meatloaf Seasoning Mix is a family favorite made easy - the breadcrumbs are in the mix! Savory onion and black pepper add "from scratch" flavor with every bite. 1.87 ounce package. Salt, Dehydrated Onion, Bread Crumbs (Bleached Wheat Flour, Dextrose, Yeast, Partially Hydrogenated Soybean and/or Cottonseed Oil, Salt), Sugar, Hydrolyzed Soy Protein, Garlic Powder, Spice, Soy Sauce (Wheat, Soybeans, Salt, Extractive of Paprika (as Color) and Caramel Color.